Royal London One-day Cup final: Are Gloucestershire more than a one man show? Gloucestershire might be seen as the underdogs for this Saturday's RLODC final, but those who have dismissed the side as a one man act should look closer. As Philip Lewis reports, there is more to Gloucestershire than just Michael Klinger. There was a moment in Gloucestershire’s Royal London One-day Cup campaign this summer when you just had the feeling their name was inscribed on that trophy; the trophy to be presented to the winning county for the second time in the competition’s history this Saturday at Lord’s. That moment came late in a rain-affected day in Bristol in the game against Derbyshire. 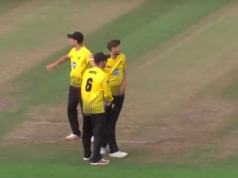 Several interruptions culminated in Gloucestershire being set 68 in four overs to win. It went to the last ball with the home side needing six. Jack Taylor tried valiantly to repeat the rope-clearing exploits from earlier in his innings, only to sky to mid-on for an easy catch. The Derbyshire whoops of joy quickly dissipated as a no-ball was signaled for a fielding infringement. Three runs were added to the Gloucestershire total, so three to get. Casting aside the general confusion of players and spectators alike, Benny Howell smashed the seventh ball of the final over to the long-on boundary for the unlikeliest of home victories. This was the closest of four close finishes that resulted in Gloucestershire victories. Leicestershire were beaten from the last ball at Grace Road while both Somerset and Bristol were vanquished in the final over at Bristol. Of course, those who don’t believe in cricketing fate will dismiss all this as nonsense. They will point to one man as the reason why Gloucestershire are playing at St John’s Wood for the first time since 2004: the Australian, Michael Klinger. Nobody can deny that Klinger has had the most remarkable season in both red and white ball competitions. In the RLODC he has been to the crease seven times and only been dismissed on four occasions. Three innings have resulted in centuries and two in 50s. He has a strike rate a nearly a run a ball and has scored 531 runs for an astonishing average of 132.75. This spectacular 50 over record is even more impressive when you consider he has hit five more tons in the other two competitions, which means he has amassed over 1600 runs in total and he didn’t even arrive in England until the end of May. So cricketing logic suggests that if Klinger goes cheaply on Saturday, Surrey are home and dry. Don’t believe it! Those of us with memories stretching back to the glory days of the late 1990s and early 2000s, and there will be plenty of those in North London on Saturday, will tell you that the main strength of that Mark Alleyne- lead side was that they possessed a defining characteristic of all unfancied sports teams: that the sum is greater than the individual parts. And so it is in 2015. 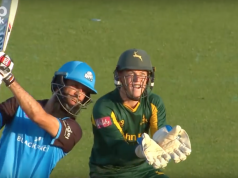 It would be foolish to deny that Klinger is the star turn, but he is not the only man from Nevil Road who has played superb cricket in the RLODC. Benny Howell deserves to be at the top of the list of the unknowns who may just become better known to the cricketing public on Saturday. It’s clear to see that he has gained enormously from the coaching of former Gloucestershire great, Ian Harvey. Howell has that same nagging accuracy and inventive variety of deliveries that was the feature of Harvey’s bowling. Indeed, it was Howell’s squeezing of the Yorkshire middle order that set up the marvelous win at Headingley in the semi- final. In addition to his hugely improved bowling Howell has had a great competition with the bat, scoring runs in a swashbuckling way just when they have been needed. The ability to bat and bowl well in situations where it’s most valuable has been a feature of another unheralded Gloucestershire all-rounder in the competition. The young off-spinner Jack Taylor has bounced back with great resolve from being banned for a suspect action a couple of seasons ago. He has shown what a valuable white ball bowler he is, with a similarly tight display to that of Howell’s against Yorkshire in the semi- final victory. Added to his growing reputation with the ball, Gloucestershire fans have been thrilled with Taylor’s six- hitting in the 50 over format. 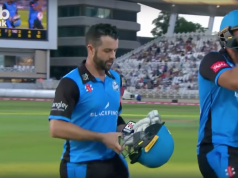 Geraint Jones, playing as a batsman in the RLODC has, shown that he still has plenty to offer with nearly 300 runs at a run a ball, although Lord’s will almost certainly be his last appearance in senior cricket. Setting aside veterans Klinger, Jones and Hamish Marshall, this is a young Gloucestershire side that may well relish the big occasion. But much will depend on the way in which the inexperienced quick bowlers, David Payne, James Fuller and Craig Miles – who have taken 40 wickets between them in the competition – settle into their work. Surrey will not be playing ‘Klingershire’, as one unfair pundit tweeted during the semi- final run chase. In fact, nothing could be further from the truth. Gloucestershire are a team. They might surprise a lot of cricket fans, and perhaps even themselves, on Saturday. Although I’ve seen most of Gloucestershire’s One-day games this summer, you may be inclined to dismiss my thought as fanciful optimism. But I’ll leave the last word to the legendary stumper from the heart of the ‘Shire: Jack Russell. He spoke this week to local news outlet, the Stroud Life.